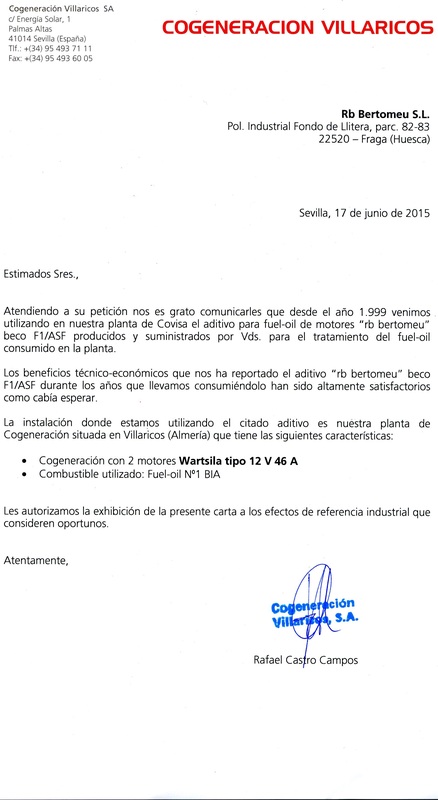 In reply to your request we are pleased to comunicate that since 1999 we have been using in our plant, Covisa, the additive for fuel oil engines "rb bertomeu" beco F1/ASF, manufactured and supplied by your company to treat the fuel oil consumed in this plant. The economical and technical benefits delivered after using the additive "rb bertomeu" beco F1/ASF during the years after which we have used it, have been greatly satisfying as expected. We authorise the exhibition of this letter as a reference for industrial purposes. In reply to your request we are pleased to comunicate that since some time ago we have been using the fuel oil additive "rb bertomeu" beco F1/ASF , manufactured and supplied by your company. The obtained results , technical and economical, are as expected when we decided to use them.